The simplehuman Trash Can – The Lower Case first letter is intentional! 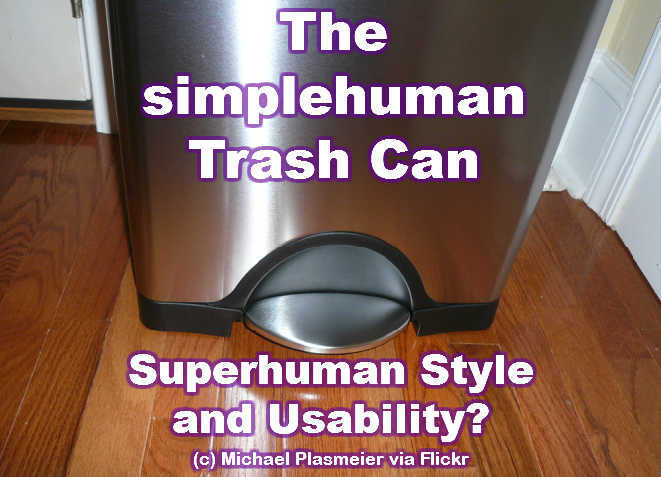 The owner of the simplehuman Trash Can business, sees their trash cans as art objects. His name is Yang and his small company (reportedly only about 60 staff strong), is devoted to making superb trash cans. simplehuman, is meant to be spelt with a small S, like iNTEL, and iPhone, so maybe they are aiming at a similar level of product dominance one day for their simplehuman Trash Cans. The unique business proposition is to develop innovative and reliable engineering design to move the trash can in the corner of every kitchen inot a new era of sophistication and longevity in use. Commonly used household objects in other areas have been given this sort of treatment from time to time, and elevating quality expectations to heights usually reserved for cars and computers can result in some amazingly good products. While approximately half of simplehuman’s trade comes from selling their trash cans, the company derives the majority of their sales from sleek and functional automatic soap dispensers, dish-drying racks and cool shower caddies. Simplehuman liners are tailored to fit cans perfectly, so the bag stays completely hidden when the lid is closed. Custom fit can liners: Our liners are tailored to fit our cans perfectly, so the bag stays completely hidden when the lid is closed. Thick double seams: Extra durable plastic and thick double seams prevent rips and tears. Convenient drawstring handles: Convenient drawstring handles for easy lifting. Handy dispenser packs: Perforated opening for easy dispensing. simplehuman® garbage bags stay completely hidden when the lid is closed. Trash can liners fit tightly around the inner bucket and won’t slip into the trash. Available in a range of sizes, these liners are made from extra durable plastic with thick double seams to prevent rips and tears and convenient drawstring handles so they are easy to lift, tie and carry.